Please contact us if you wish to customize a bundle for your specific needs. The Orion for Clubs C230 bundle is intended for the small to medium size clubs or teams. 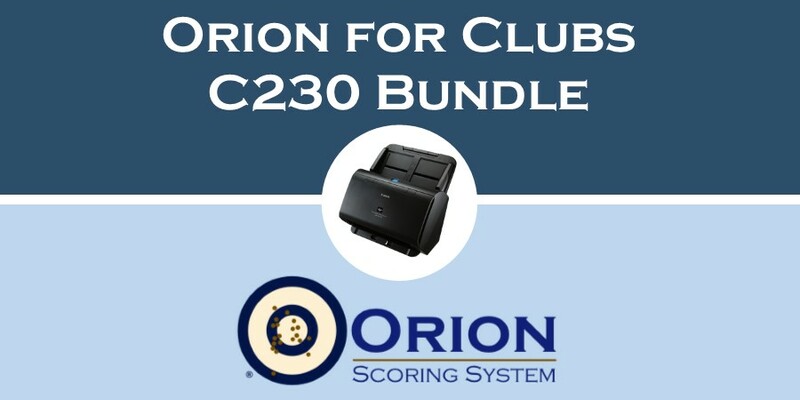 Orion for Clubs is the full featured Orion Scoring System. It provides Orion's world-class scoring accuracy, ease of use, coaching tool, Virtual Matches, and access to the Result Center. First year full featured Orion for Clubs license. A Canon C230 high speed scanner. Free registration, for the first year, into the Orion National Air Rifle, Air Pistol, or "New Shooter" League. Accurate: Orion for Clubs is approved by USA Shooting, the Civilian Marksmanship Program and the National Rifle Association and meets international scoring standards. Affordable: Orion C230 Bundle sells for $1098. It includes the first year license to Orion, a Canon DR-C230 high speed scanner scanner, and your choice of targets. Speedy: The DR-C225 scanner can scan about 20 targets a minute. Decimal Scoring: Orion for Clubs scores in either decimal or integers. Orion Targets: Orion for Clubs works with all available Orion targets, including air rifle, air pistol, smallbore rifle, smallbore pistol, and BB Gun. Scoring large format targets does require use of Orion's mobile phone application. Easy to Use: Orion’s Auto-Score technology lets you scan and score targets at the touch of a button. Shot-Group Analysis: Orion for Clubs includes Orion’s popular Shot-Group Analysis feature, letting athlete see common shooting errors graphically. Virtual Matches: Orion for Clubs allows teams to participate in Orion’s Monthly Virtual Matches, or create other Virtual Match to compete against other teams. To use Orion for Clubs you must have a Windows based computer (Windows 7 or greater) and an Internet connection. A printer is highly recommended but not required. The annual renewal license fee for Orion for Clubs is $98. The Canon DR-C230 that comes with the Orion for Clubs C230 Bundle has a 3 year warranty provided by Canon. Extra targets and accessories sold separately.